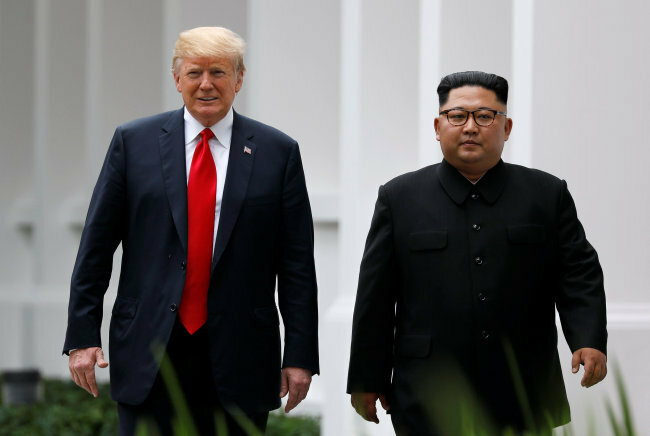 Over 60 percent of South Koreans expect a positive outcome of denuclearization in the planned summit between US President Donald Trump and North Korean leader Kim Jong-un, a poll showed Monday. In a Realmeter poll conducted Friday, 62.5 percent of 501 respondents answered they expected some results in resolving North Korea’s denuclearization issue in the upcoming summit. On the other hand, 35.1 percent of the respondents said the summit will only weaken US-South Korea ties without bringing out any concrete results. The outlook appeared to be sharply divided according to the political orientation of respondents. While 81.2 percent of the respondents who viewed themselves as liberals were optimistic about the summit, 18.1 percent gave a negative outlook. On the other hand, 54.2 percent of the conservative respondents were pessimistic about the summit while 43.5 percent were optimistic. Trump and Kim are expected to hold a second summit in Hanoi, Vietnam, Feb. 27-28, during which they are expected to discuss the denuclearization of the Korean Peninsula and economic sanctions imposed against North Korea. Their first summit was held on June 12 in Singapore.